You may be surprised but sweet potato is allowed in the 3rd and 4th phase of Atkins. It's an excellent source of antioxidants and "good carbs". Sweet potato gives this filling soup the right amount of flavor and zip. This creamy soup is healthy, rich, and tasty, and I've prepared it countless times. It makes for a great take-to-work lunch or brunch and is hearty, delicious, and flavorful. 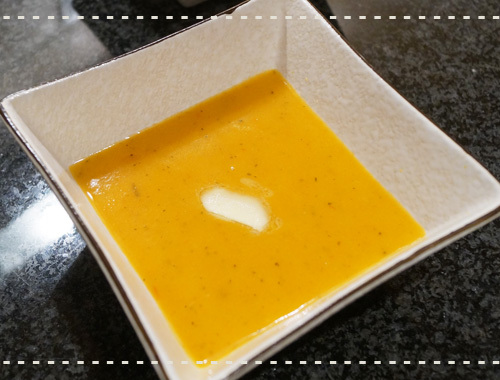 This soup is light and fits well into a low carb diet-friendly menu. Sweet potato gives it a beautiful appeal and taste. It is easy to prepare when time is tight and is very satisfying. You can add kale for more flavor. Slice the carrot, peel the sweet potato, and grate it. Heat butter in a pan and cook onion for 2 - 3 minutes. Add garlic and cook for 2 minutes or until soft. Then add the carrot, cook for 4 - 5 minutes, and add the sweet potato and water. Cover with a lid. Bring to boil and simmer for 5 - 6 minutes or until tender. Remove from heat when the carrot and potato become soft. Stir occasionally. Add the tomato sauce and basil, season with salt, and cook for 1 more minute. Remove from heat and leave aside for 10 - 15 minutes to cool. Check the seasoning and blend until smooth using a stick blender. If you want to adjust the thickness, you can add some whole milk. Transfer to the pan again, pour milk, bring to boil, and let it simmer for 3 - 4 minutes.